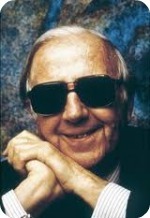 George Shearing died early today at the age of 91. With his quintet, Shearing used a locked-hands technique at the piano, blending with vibes and guitar to develop a style that resonated with listeners and became one of the most recognizable sounds in an era when jazz was still at the core of popular music. He was already a success because of his hit version of “September in the Rain” when the record of his 1952 composition “Lullaby of Birdland” solidified his popularity. The song also provided Shearing a reliable annuity; dozens of instrumentalists and singers incorporated it into their repertoires and recorded it. Shearing, born blind, had become widely known in his native England when he moved to the United States in 1947. He was an early admirer of Bud Powell and quickly adapted to the new strain of music that came to be known as bebop. He was a fleet and inventive improviser whose brilliance was sometimes taken for granted because of his band’s popular success. To read all of the AP’s Shearing obituary, click here. When vibraharpist Charlie Shoemake joined Shearing in 1967, the other members were guitarist Joe Pass, bassist Bob Whitlock and drummer Colin Bailey. Shoemake stayed for seven years. Here is Shearing in the early 1950s with his composition “Conception,” which became a jazz standard. The quintet has Don Elliott, vibes; Chuck Wayne, guitar; Denzil Best, drums; and John Levy, bass. locked-hands passages is truly a study in impossibility!! After listening recently to some of his earliest recordings (still thankfully available thru Amazon) I was reminded once again how original and daring were many of his “conceptions,” as well as how his quintet sound had defined an entire era, triggering such strong memories of things past. I played drums for George in 1964, and in 1966-7 for about a year. It was a great gig. George was such a marvelous person, incredible musician and piano player. It’s one of the things in my career that I’m proud of, that I was a member of the George Shearing Quintet. When we were on the road, George took us every week to the finest restaurant in town, we had a lot of fun. I hadn’t seen him in quite a while, but I’ll miss him very much. Doug's most recent book is a novel, Poodie James. Previously, he published Take Five: The Public and Private Lives of Paul Desmond. He is also the author of Jazz Matters: Reflections on the Music and Some of its Makers. He contributed to The Oxford Companion To Jazz and co-edited Journalism Ethics: Why Change? He is at work on another novel in which, as in Poodie James, music is incidental.